In October, Meier & Dutch, announced Lucious Lyon. If the Meier & Dutch name doesn’t ring a bell, it is the distribution arm affiliated with Cigars International, which is owned by the Scandinavian Tobacco Group, which is also the parent company of General Cigar. The Lucious Lyon cigar line—certainly not the first cigar venture aiming to capitalize on a TV series (e.g., The Sopranos, Breaking Bad)—is named after Empire’s lead character, portrayed by Terrence Howard. Along with the cigar, Meier & Dutch also released a line of complementary Empire-themed accessories, including a crystal ashtray, a high-gloss humidor, and a cutter and lighter by Xikar. 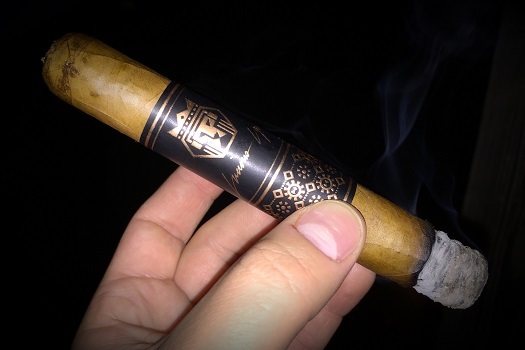 The cigar is made in Honduras at the STG Danlí factory and features a Connecticut wrapper, dual Connecticut Broadleaf and Mexican binders, and filler from four countries: the Dominican Republic, Honduras, Nicaragua, and Mexico. Three sizes are available: No. 1 (5.5 x 50, robusto), No. 2 (6 x 54, torpedo), and No. 3 (6 x 52, toro). I smoked several Lucious Lyon No. 1s for this review. This vitola retails for $12.50 and comes with a large black band that easily slides off the oily Connecticut wrapper. Underneath is a well-rolled cigar with tight seams and soft pre-light notes of hay and molasses. The cap clips easily to reveal a moderate cold draw. Overall, the robusto makes a good first impression and sets the expectation that it is a high-quality mild cigar worth of your attention. After an even light is established, the initial profile is dry, spicy, and surprisingly potent. The most prominent flavors include oak, cedar, salt, bread, and more black pepper spice than I was anticipating. After about half of an inch, however, the spice subsides a bit, and notes of cream and roasted nuts start to displace the dry bite. Thereafter, the robusto settles considerably into a mild- to medium-bodied experience with a focus on cream, hay, oak, and occasional hints of peanut. Throughout, the draw is slightly tighter than I would prefer, and the smoke production is a little below average. That said, the burn line is straight and true from light to nub, and the ash holds very well off the foot. I can’t help the fact that I’ve always been weary of any cigar bearing a celebrity name, an endorsement from a popular athlete, or a tie-in to a TV show. My sense is you often pay dearly for the name and licensing, while more important aspects like tobacco, blending, construction, etc. can be somewhat of an afterthought. In the case of Lucious Lyon No. 1—while I’m sure a portion of the $12.50 price tag represents a licensing fee to FOX—I’m happy to report the cigar is pretty good. Overpriced, but good. In my book, this robusto would score better if the price more closely matched the quality of the experience. It would be a much better value in the $6-8 range. As it is, though, the Lucious Lyon No. 1 is a good mild- to medium-bodied smoke that gets off to a fast start and quickly settles into a creamy, nutty profile that’s familiar yet enjoyable. That earns it a mark of three stogies out of five.